June 11, 2018, El Cajon, CA – It was only a matter of days before the 50th running of the SCORE International BAJA 500 when Jerett Brooks got the call. His first taste of BAJA, his first desert race, his first Trophy Truck opportunity. The only stipulation, it’d come in the role as navigator. Jerett would be riding with off-road legend and head honcho at Racer Engineering, Dale Dondel, at the BAJA 500. For Dondel, racing the BAJA 500 was nothing out of the ordinary, even if it was somewhat of a last minute decision to enter. Dale is a seasoned veteran who has been winning races and championships since the early 90’s. In addition to racing, he’s also been building championship-caliber race vehicles for legends like Johnny and CJ Greaves, Doug Fortin, and Jimmy Smith to name a few throughout the duration of his career. 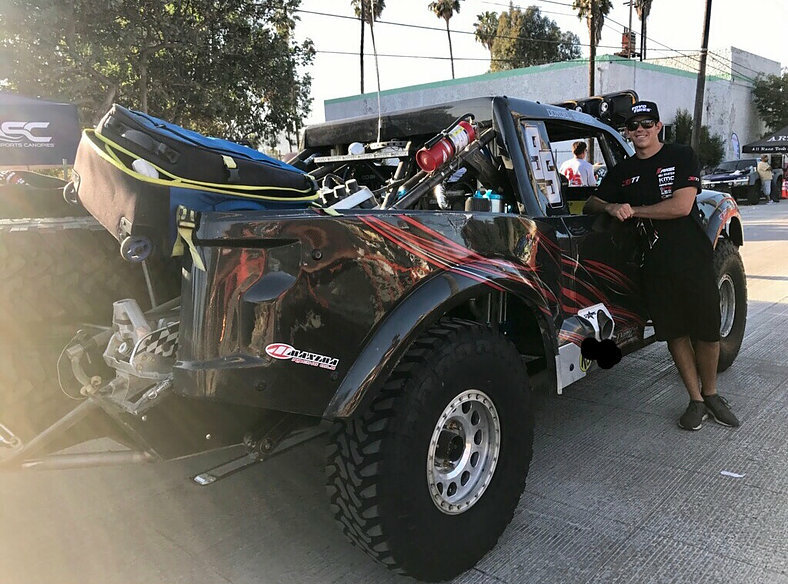 In fact, two Racer Engineering-built trucks owned and driven by Luke and Dan McMillin earned 2nd and 4th place finishes last weekend at the BAJA 500. For Jerett however, this was all brand new. A 3-time short-course champion, making a name for himself at just 20 years of age, Jerett is every bit a rookie when it comes to desert racing but he was certainly eager to see the green flag wave. Jerett arrived in Ensenada on Wednesday morning of race week. Without much time to pre-run or learn the course, Jerett would rely solely on notes that were provided to him while also familiarizing himself with the GPS in front of the passenger seat that he’d be staring at for a better part of Saturday. He quickly realized this was much different than the quick glances at his Motec dash in the Pro 2 that he was used to. He also had to get familiar with the truck in general in the event he’d have to change a tire or diagnose any mechanical issues that could potentially take place. With a few days of practicing tire changes, going through tech inspections & contingency requirements, team and driver’s meetings now complete, Dale Dondel and Jerett Brooks were ready to take on the 50th SCORE BAJA 500. Dale and Jerett reported to staging at around 7:00am on Saturday morning and would wait their turn to take the green flag. When asked if he was nervous, Jerett said “Oh yeah.. I was so nervous. Having never been in a desert race before, let alone in a Trophy Truck, my nerves were pretty high. But I was pumped!” At 8:00am, the first truck left the line. 28 minutes later, Dale and Jerett, the 28th truck off the line, started their journey. Jerett Brooks was riding in a Trophy Truck race in BAJA. But nobody said it’d be easy. Especially for a rookie. Right off the bat, Jerett dealt with GPS issues. Unfortunately for him, the tracker wasn’t keeping up with their current location and Jerett had to manually update, or move, their location on the screen to keep up with upcoming turns, obstacles, and notes on the course. Not the most ideal situation for a new navigator with no course experience. But eventually the GPS issue was resolved and they were settled in to a smooth pace. With 27 trophy trucks ahead of them on the course, winning the race would be no easy task. It’s never a guarantee to even finish a race in BAJA, let alone win. However, improving their position on the course and giving themselves the best chance to finish would be priority. With a number of race vehicles dropping out of the race within the first couple hundred miles, and physically passing a half a dozen trucks, Dale and Jerett had moved inside the top 20. They were cruising for the first 150 miles or so and finally Jerett would be tested. They’d suffer from their first setback and Jerett would have to climb out of the truck. They were stuck. Jerett would end up running a mile back to the nearest group of spectators they had passed to recruit some help. He hopped in the back of a local’s pickup truck, headed back to the race truck, and they dug it out. Roughly 100 miles later, they’d be tested once again and this time Jerett had to change his first flat tire. It wasn’t a drill.. it was for real this time. Jerett commented that “the flat was red-hot making it much more difficult to remove compared to the practice attempts back in Ensenada”, but he got the job done and they were off once again. Finally, at race mile 237, a broken A-Arm would take them out of competition once again, this time permanently ending their BAJA 500. Jerett will be back in the #77 Rigid Industries Pro 2 June 23rd in Wheatland, Missouri.